This system enables the monitoring of tyre pressure. It allows the driver to keep under control one of the most important safety parameters, as it is able to detect the possible difference in pressure versus the standard level. It is a range exclusively composed of OEM parts with specific versions (already programmed) and universal ones (to be programmed). 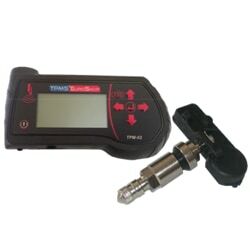 TPMS Starter Kit includes 1 TPMS programmer, 4 original universal sensors, 1 USB cable, 1 CD-ROM and 1 instruction manual.